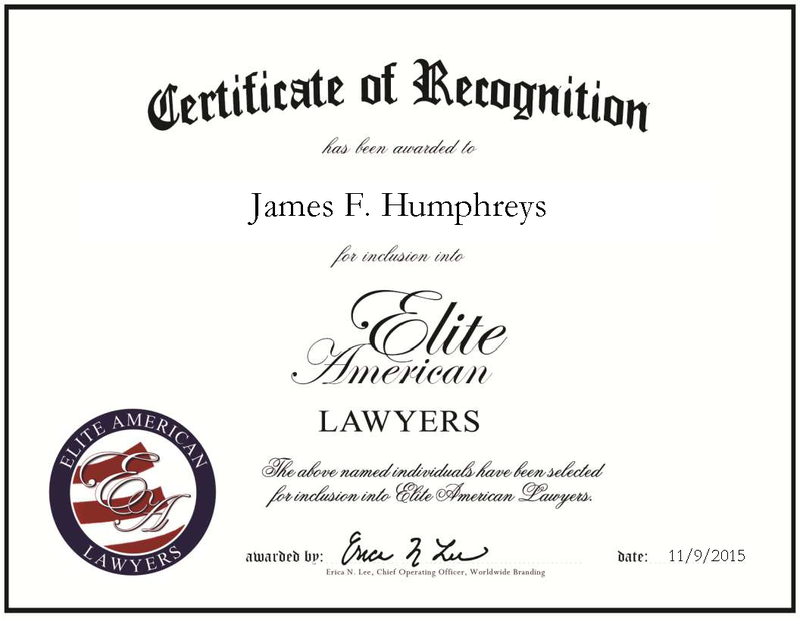 Charleston, WV, November 9, 2015, James Humphreys, Owner of James F. Humphreys & Associates, LC, has been recognized by Elite American Lawyers for dedication, achievements and leadership in personal injury law. “When someone is injured at the negligence of another person, it can impact their way of life mentally, emotionally and physically for the rest of their life,” says Mr. Humphreys, who uses this perspective to fight tirelessly for justice for his clients in the Charleston region. Backed by 36 years of expertise and experience, he takes on matters of personal injury resulting from car accidents, trucking accidents, slips and falls, product malfunction, medical malfunction and more. He demonstrates a particular expertise in those who have become sick due to their unknown exposure to asbestos and mesothelioma. Mr. Humphreys earned a JD from the George Washington University Law School in 1979 prior to establishing his career in the law field. An educated professional, he also holds a Master of Public Administration from Princeton University, a Master of Arts from Ohio State University and a Bachelor of Arts from West Virginia University. An AV preeminent attorney, Mr. Humphreys is recognized by the ABA, the American Association for Justice and the West Virginia State Bar. This year, Mr. Humphreys was selection for inclusion in “Top Lawyers: The Secrets to their Success.” This honor comes on the heels of his distinction as a Super Lawyer and the title of Philanthropist of the Year. Committed to his private practice, Mr. Humphreys intends to continue expanding the practice in the years ahead. This entry was posted in Personal Injury and tagged asbestos, car accidents, mesothelioma, product malfunction, slip and falls, trucking accidents. Bookmark the permalink.